Reprinted from The Guardian, June 8th, 2013 – by Dave Stewart – Alan MacPhee of Hartsville was ministering in the community for 15 years when he sensed another calling. The beef farmer was moving a bale of hay one day when it came to him — he wanted to combine his love for helping people with his desire to go into business. 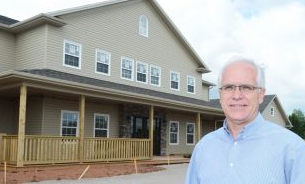 Soon, he will open the doors on his new venture — the Burnside Community Care home in Clyde River. “Business was always something interesting, in my mind,’’ MacPhee said in an interview as a construction crew worked not far away getting the 40-bed, three-floor home ready. So, he stepped down as minister of a parish in Hartsville. He quotes scripture (Hebrews 11:8) to convey what he felt at the time he knew his life was moving in a new direction. MacPhee had a partner who was interested in investing in the community care facility with him but that partner wants to stay silent. So, MacPhee started looking into community care facilities. He met with the owners of the Andrews facilities in Charlottetown and Stratford and toured similar facilities in Tignish and Eldon. Burnside will have 40 beds, featuring both single- and double-bed rooms. The building, which sits directly beside Burnside Presbyterian Church in Clyde River, has three levels, wheelchair accessible showers, dining room, community room, a chapel, beauty salon, activity room and two lounges. The outside will feature a courtyard, screened-in deck, veranda, walking trail and a garden. MacPhee thinks the top floor will be dedicated to assisted living or independent living. MacPhee says lots of effort will be put into decoration to bring as much life to the place as possible. That includes buying just the right furniture, drapes and bed spreads. In other words, he doesn’t want residents to feel like they’re living in a community care facility. He wants them to feel like they just moved into a new community. As for staffing needs, MacPhee is getting plenty of interest. So far, he’s hired about six people, including a cook, resident care worker, licensed practical nurse and a registered nurse. As for the name of the facility, Burnside just happens to be the name of the adjacent church and in Scottish means ‘by the river’. For more information, contact MacPhee at 621-0284 or 394-1241 and by email at a.macphee@pei.sympatico.ca.